Prototype: German Federal Railroad (DB) passenger car, 2nd class, for so-called lightweight express trains (LS). Type Bylb 421. Colloquially also known as "center entry cars". Version with small marker lights at the ends near the top of the car and one-piece windows at the entries on the ends of the car. "Ocean Blue" / ivory paint scheme. Based at Hagen Main Station. The car looks as it did in 1984. 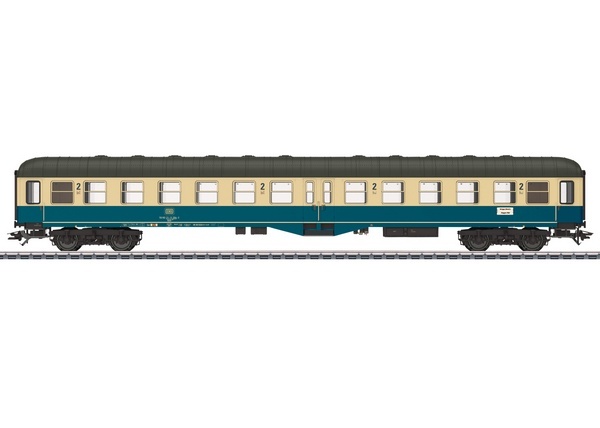 Cars to go with this car can be found in the Märklin H0 assortment under item numbers 43125 and 43335. A diesel locomotive to go with this car can be found in the Märklin H0 assortment under item number 39212. This model can be found in a DC version in the Trix H0 assortment under item number 23165.